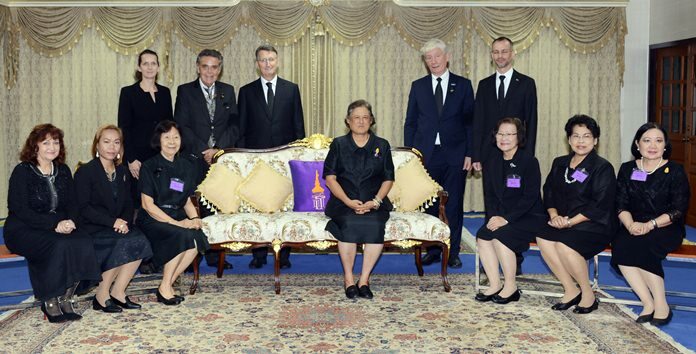 Group picture with HRH Princess Sirindhorn. (Standing from left) Dr. Christine Falken-Grosser, Axel Brauer, Ambassador Peter Prügel, Juergen Koppelin and Jan Scheer. (Sitting from left) Elfi Seitz, Jinthathai‚ ‘Bo’ Songkram, Prof. Dr. Ampha Otrakul, HRH Princess Sirindhorn, Prof. Khunying Sumonta Promboon, Prof. Santanee Phasuk, and Prof. Buarong Lewchalermwongse. 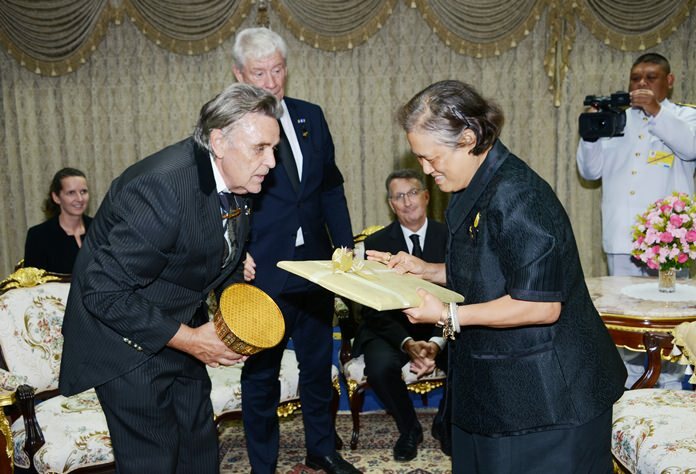 Following on his visit to the Chitralada Technology College, German businessman and new royal college sponsor Axel Brauer was granted an audience on Sept. 5 with HRH Princess Maha Chakri Sirindhorn. The Berlin native and frequent Pattaya visitor was joined by his partner Jin­thathai Songkram, former German MP Juergen Koppelin, German Ambassador Peter Prugel, his deputy and Pattaya Blatt editor Elfi Seitz. Axel Brauer presents the cheque to HRH the Princess. The group was welcomed at the main gate by palace guards in traditional uniform and ushered through the palace’s lush park to HRH the Princess’ royal residence where they were greeted by college rector Sumonta Promboon and high ranking professors. The group proceeded to a waiting area adorned with photographs taken by HRH the Princess, mostly of her dogs, cats and birds. HRH the Princess soon entered and graciously welcomed the group before accepting flowers, a statue of Berlin’s “golden bear” icon and other gifts. 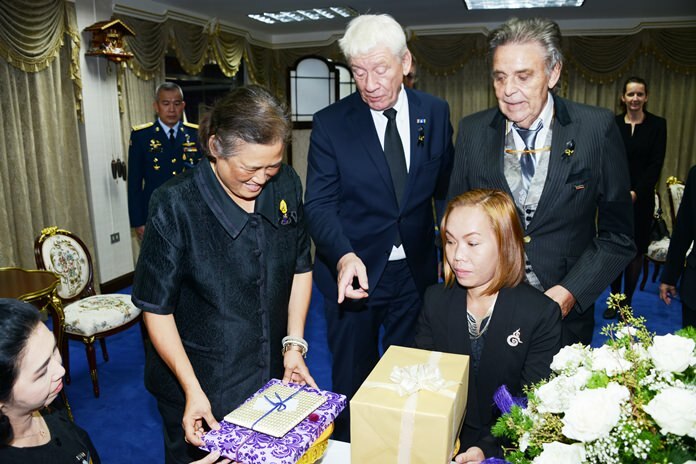 Her Royal Highness thanked Mr. Koppelin for his continued help to Thailand and also thanked Axel Brauer for sponsoring the technology college with a million baht a year for five years. A hearty welcome by the Princess. 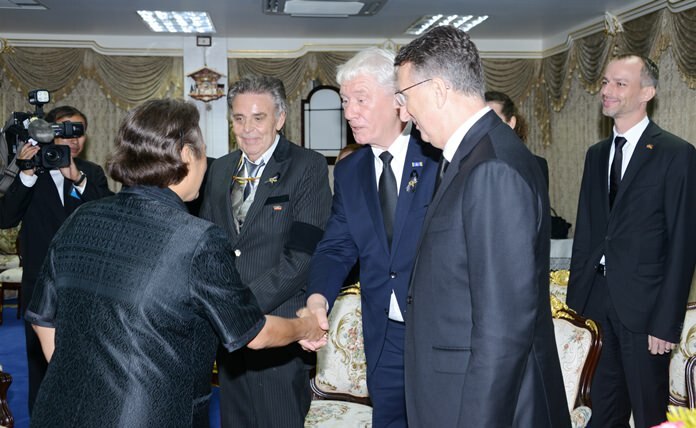 (l-r) HRH Princess Sirindhorn, Axel Brauer, Jürgen Koppelin and Ambassador Peter Prügel. 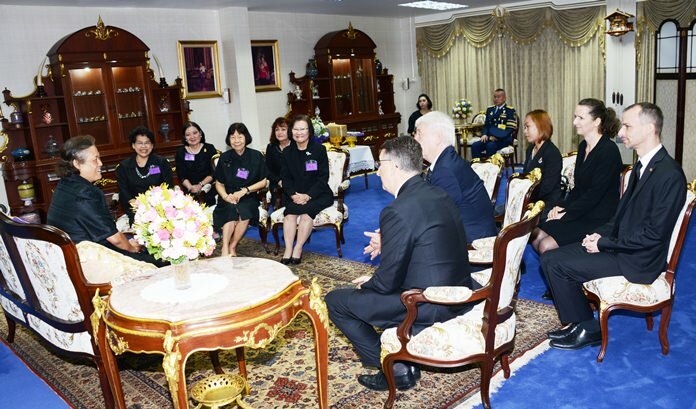 Speaking fluent German, Her Royal Highness expressed her concern about education in Thailand, saying that it was essential for Thai students to get a good education and proficient vocational training. Axel Brauer presented his donation in the form of an oversized cheque in a large frame. 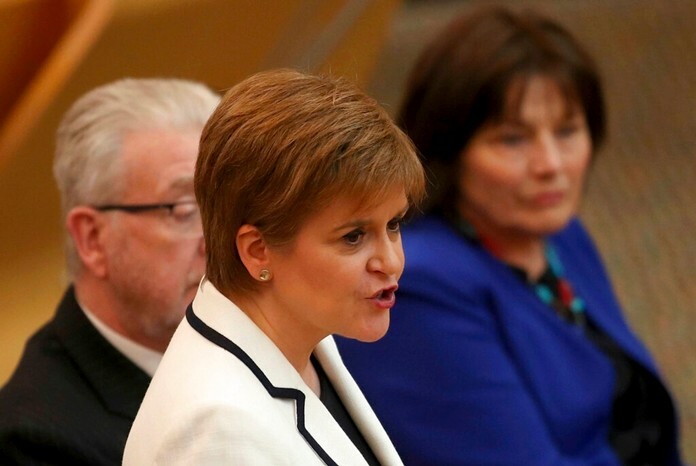 Even Her Royal Highness remarked on its size. After 90 minutes HRH the Princess bid the group farewell, leaving them with an unforgettable memory of their royal visit. HRH the Princess graciously accepts gifts from the German visitors. 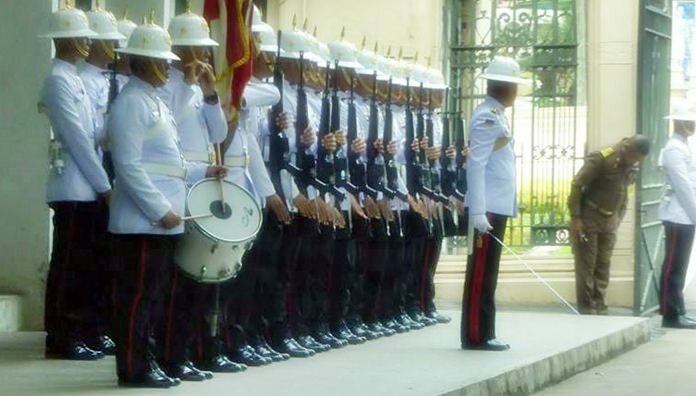 HRH Princess Sirindhorn graciously converses with her guests.